Josef Herman was born in Warsaw in 1911. The son of a Jewish cobbler, he was a painter, draughtsman and writer. He studied at the Warsaw school of Art for 18 months between 1929 and 1931 before dropping out to become a graphic designer. He spent time in Brussels following the Nazi invasion of Poland, where he was influenced by Permeke. In 1940 he moved to Britain and lived in London, Glasgow and South Wales where he had a studio in the mining village of Ystradgynlais for over a decade. He embarked on a series of sombre-hued paintings and ink drawings of retrospectives at the Whitechapel art gallery. He lived in London from 1953 but travelled widely and although he is best known for his depiction of working life including land workers, peasants and mining scenes he also produced still lifes and landscapes. In 1975 he published his autobiography "Related Twilights". He was awarded an OBE in 1981 and in 1990 was elected to the Royal Academy. Josef Herman sadly passed in 2000. The Tate Gallery, London; Nation Museum of Wales, Cardiff; Glynn Vivian Art Gallery, Swansea. Gold Medal for Fine Art, Wales National Eisteddfod. 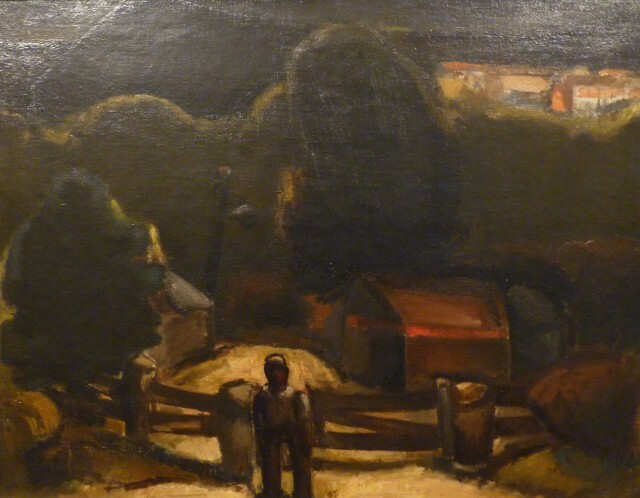 Josef Herman Foundtations, Ystradgynlais; The Secret of Belonging, National Theatre of Wales.